On Saturday, February 21, TOTA Lounge hosted the Second Annual Wayback Playback night in support of Memory Ball and the Alzheimer Society of Toronto (AST). Despite the extreme cold and falling snow, 100 avid party-goers and J.Lo & Ja Rule enthusiasts danced their heart outs at this packed Queen West venue. External Memory Ball events like this one have been major successes adding thousands of dollars to the bottom line, for which, we are hugely grateful. This year, Wayback Playback earned just shy of $1,500! With Memory Ball around the corner, the YPAA wouldn’t be able to have nights like this without the complete support, planning and overall awesomeness from our dear friends, Victoria Ludwig & Thomas Gaylor. 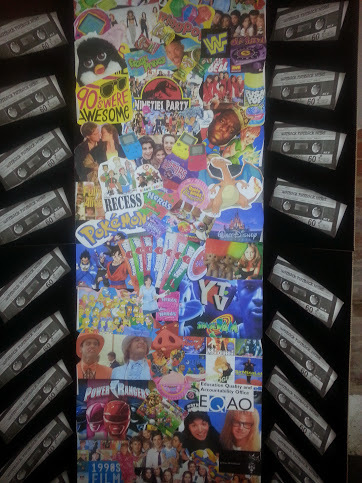 Tom and Tori worked tireless to create this backdrop for Wayback Playback night – spot your favourite 90s memories! Tom and Tori have been active with Memory Ball from the get-go, Tori worked the event’s entrance during the inaugural Memory Ball, and has been a major and fantastic volunteer over the years. She’s a gift bag expert, our resident Personal Shopper (from The Room at the Hudson’s Bay), and an extremely capable team member! Tom shines in the sponsorship arena; he’s a “New Business” guy, who’s been instrumental in some key partnerships over the years. Those really cool graffiti art pieces from last year’s silent auction… all thanks to Tom and he tirelessly pursues major sponsors to help us raise even more funds for the AST. Want to learn more about these 2 stellar volunteers? Read on. • How long have you been involved with Memory Ball? I have been involved with Memory Ball since its first year. I remember setting up the event and cutting out 1000 raffle tickets. Since then, I knew this was a special event and have become more involved every year. 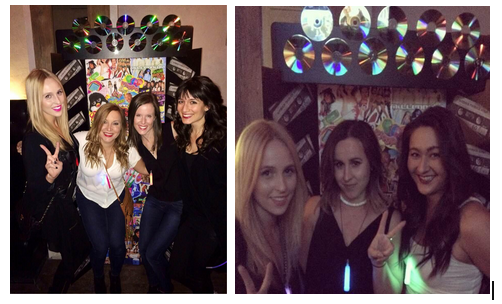 Last year, I organized YPAA’s first “Wayback Playback Night” a separate fundraising event for Memory Ball in January. • Why is Memory Ball a worthy cause? Memory Ball is important as it teaches the younger generation about Alzheimer’s, something often considered an older person’s disease. I first learned about Alzheimer’s when I became good friends with Carolyn Poirier at University. My Grammy was subsequently diagnosed with this condition, and I am now even more determined to help raise awareness and funds for Alzheimer’s research. • Favourite Memory Ball & why? Each and every Memory Ball has been my favourite for completely separate reasons. The first, because it was new and exciting and felt like Prom 2.0; the second because I got a little too carried away at the amazing silent auction; and the third because of the sheer number of young people that came out to support the cause! • Some words of wisdom for future volunteers? By getting involved we are taking the first steps towards changing the future. Find a cause you are passionate about and get involved in any way shape or form; small or large it all helps! Remember, you have the power to make a difference. • How long have you been involved with Memory Ball? Since its inception. 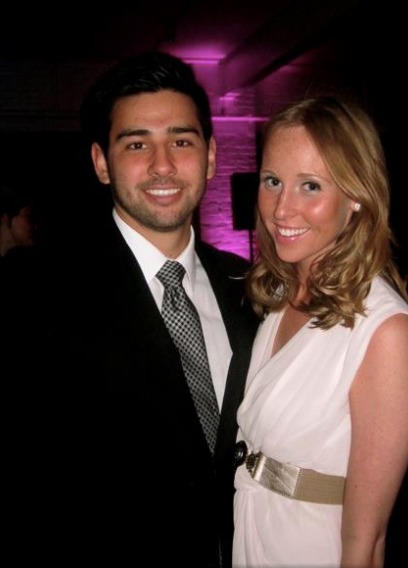 Tom & Tori at the first ever Memory Ball in 2012. • Why is Memory Ball a worthy cause? Alzheimer’s and related dementias are conditions that will touch all of our lives in some form or another. It’s important we support those on the front lines fighting these awful diseases. • Favourite Memory Ball & why? Favourite Moment? The first one. It was amazing to see something that was only an idea in a few people’s minds truly come to life for the first time. Every subsequent one continues to blow me away, especially with its growth, but I will never forget the very first one and what it took to get this movement started. • Why is it important for young professionals such as yourself to get involved with charitable causes? We have inherited a world that is as fragile as it has ever been for both the planet itself and the people that live on it. This generation has the power to develop the tools to change that. Be it health, environmental, personal… we have the ability, today more than ever, to change things for the better. That is an awesome amount of responsibility that we shouldn’t waste.